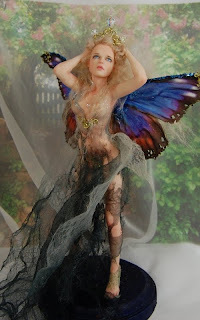 Mini Sculpture, Art Dolls in Denver: One of a kind Art doll by Nadiia Evans, Fairy, "For the love of my life"
One of a kind Art doll by Nadiia Evans, Fairy, "For the love of my life"
Deb Gillogly Herrington, Amanda Carrion- Martin, Kris Pink and 16 others like this. Cindy Kelley Simply stunning! Love it! Jeanne Hanley She's really gorgeous! Deb Gillogly Herrington Nadia so alive. Lifelike Polymer Clay Thank you Cindy and Jeanne! Hey Deb, I love pictures of your garden! It is enchanting place! Tonja Lenderman Your work is mesmerizing :) Just curious. How many hours do you put into a piece like this? Christine Von Lossberg Did it again..just gorgeous! You are so amazing and talented!!! Stuart Land You really are the best sculptor of this style out there. Each figure is exquisite. Phyllis Jorgensen Morrow She is just stunning Nadiia!!!! Wow!!!!!! Sandra Searing Vanderford She is simply breathtaking Nadia!